FLYSAFE 2019 – Help our Titi fledglings to reach the sea. Our formerly fluffy chicks have now grown most of their shiny new adult feathers and will put them to the test over the coming 1.5 months when leaving their burrows for the first time to fly out to sea. 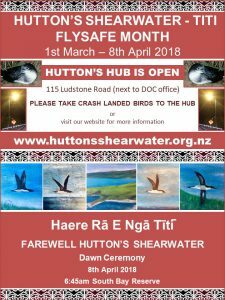 Not all of them will be successful and as such the time of the year has come again to be extra vigilant and WATCH OUT FOR CRASHLANDED HUTTON’S SHEARWATERS in and around Kaikoura. 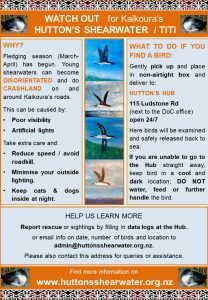 To support and facilitate the rescue of birds on the ground, this year’s FlySafe Campaign will run from 1st March to 7th April 2019. 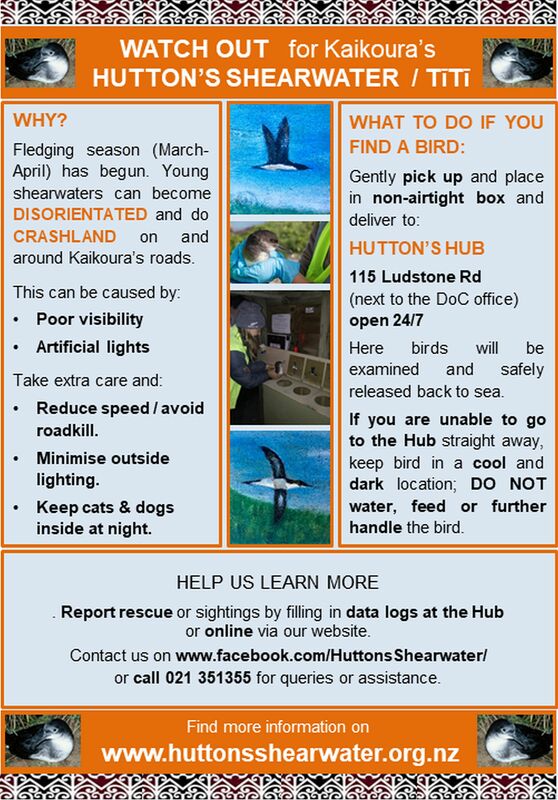 The HUTTON’S HUB at 115 Ludstone Road (next to DOC office) is open 24/7 to receive rescued birds. From here they will be examined and safely released. Please find more information on how you can support FlySafe on our info poster here. Read up on further details and background info under our Crash Landings / Fallout tab here. 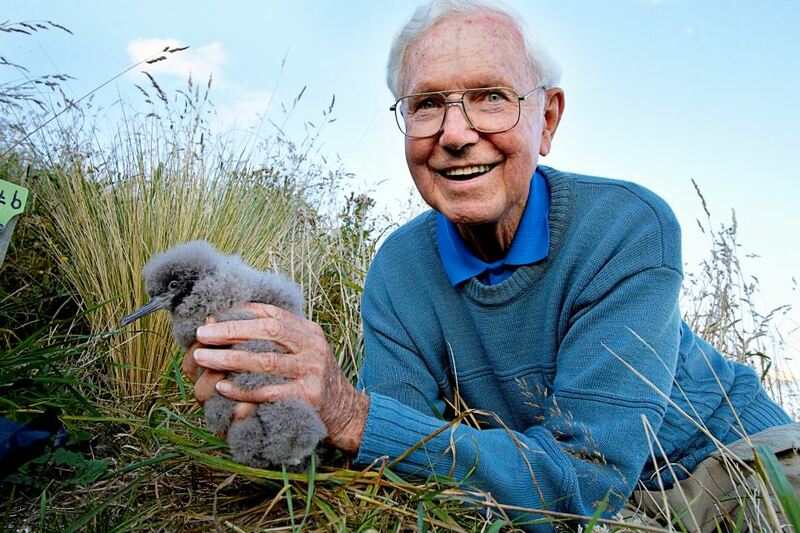 Announced today that Hutton’s Sheartwater Charitable Trust founder and patron Geoff Harrow has received the QSM for services to mountaineering and conservation. Well done Geoff – an award much deserved, in recognition of outstanding achievement. Chairman Ted Howard on behalf of all trustees. Geoff holding a hutton’s chick in the new colony he was foundational in building. The recent earthquake caused widespread damage throughout many areas of North Canterbury and Marlborough. 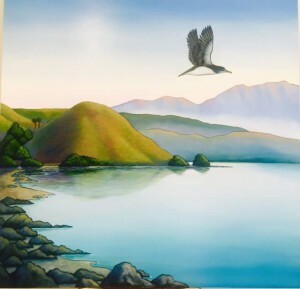 Kaikoura was especially hard hit, with the coastal landscape undergoing dramatic changes in just a few short minutes. Our Trustees seem to have come out of it reasonably well, though their stoic “I’m OK” assertions may well have disguised much more serious situations with regard to their property. 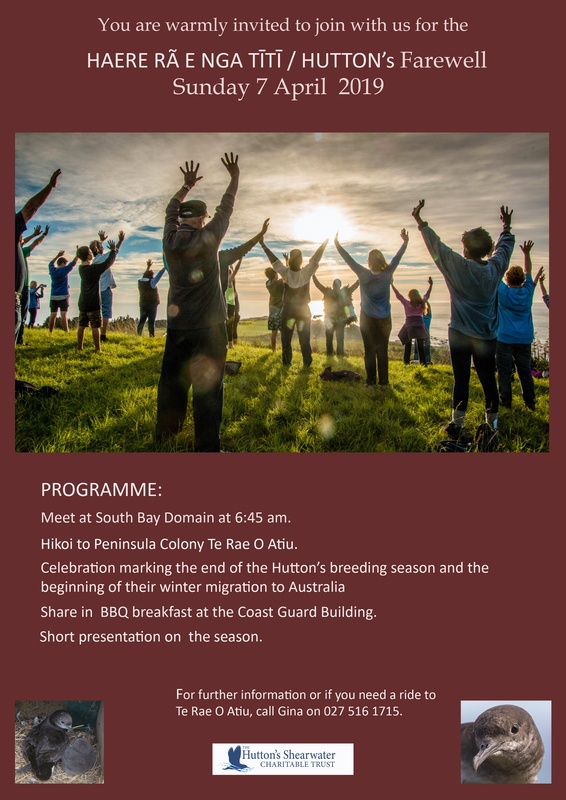 Obviously this event will have major effects on the people and economy of Kaikoura for a long time to come. The two Hutton’s shearwater mountain colonies were also affected by major landslides which covered parts of both colonies. It is not yet clear what impact this has had on the populations; this will have to wait for an on the ground assessment when it is deemed safe and resources permit (we welcome any donations to help with this through our Givealittle page). Initial estimates indicate that 10 – 30% of the two sites have been affected. The timing was unfortunate with breeding in full swing, and many birds being underground at this time of night. 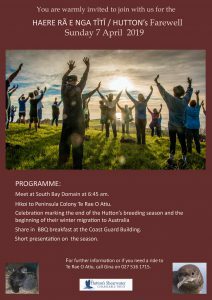 These events highlight the reasons for their ‘At Risk – Declining’ conservation status, a status which may need revision in the light of these events. 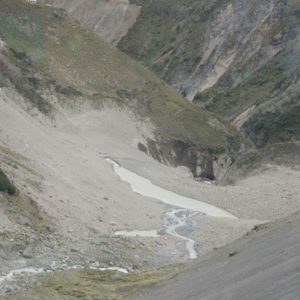 Though their total population is relatively high their breeding colonies occupy a relatively small area, at constant risk from landslides and avalanches, as well as predation and trampling. 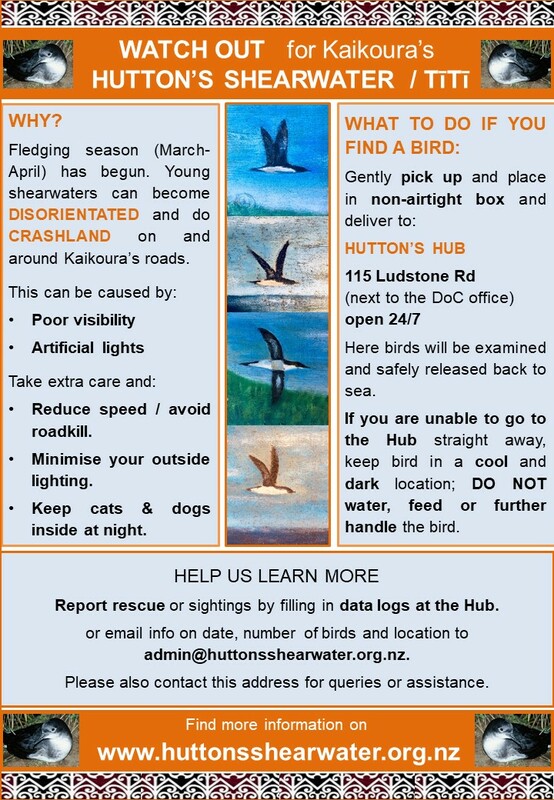 The good news is that both the infrastructure and birds at the Te Rae o Atiu colony appear to have escaped unscathed. When we have any updates they will be posted on our Facebook page. The photo below shows the valley below the hut. 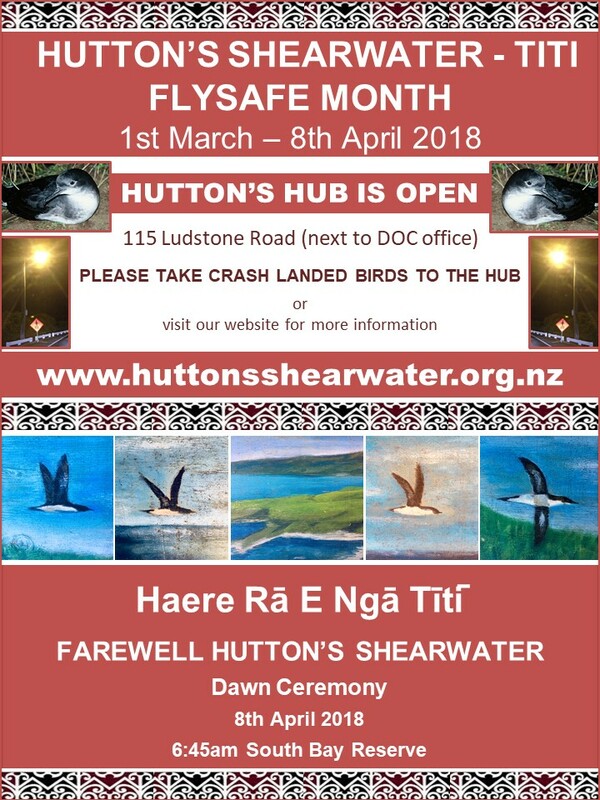 The Hutton’s Shearwater Charitable Trust recently appointed husband and wife team Elspeth Wingham and John Preece in the role of Project Coordinator for the Trust. Elspeth is a former Chair of the Trust, with a Ph.D. in marine birds, and currently splits her time between picking flowers at their Conway Flat property and babysitting her grand daughter. John works mainly in the field of wetlands. Their main goal is to secure long term funding to achieve the aims of the Trust. 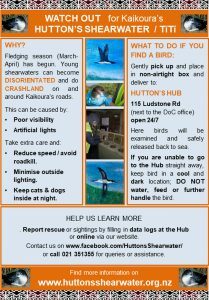 Buy Hutton’s shearwater tees and polos! 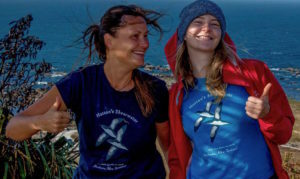 The Trust offers tees and polos in a variety of styles (unisex, ladies, kids) and colours (navy, blue, white, pink, green) under the Merchandise section of this website. By purchasing our merchandise you directly help conservation of the endangered Hutton’s shearwater. Thank you!